"Solomon Shereshevsky could recite entire speeches, word for word, after hearing them once. In minutes, he memorized complex math formulas, passages in foreign languages and tables consisting of 50 numbers or nonsense syllables. The traces of these sequences were so durably etched in his brain that he could reproduce them years later, according to Russian psychologist Alexander R. Luria, who wrote about the man he called, simply, 'S' in The Mind of a Mnemonist. "But the weight of all the memories, piled up and overlapping in his brain, created crippling confusion. S could not fathom the meaning of a story, because the words got in the way. 'No,' [S] would say. 'This is too much. Each word calls up images; they collide with one another, and the result is chaos. I can't make anything out of this. 'When S was asked to make decisions, as chair of a union group, he could not parse the situation as a whole, tripped up as he was on irrelevant details. He made a living performing feats of recollection. "The act of forgetting crafts and hones data in the brain as if carving a statue from a block of marble. It enables us to make sense of the world by clearing a path to the thoughts that are truly valuable. It also aids emotional recovery. 'You want to forget embarrassing things,' says cognitive neuroscientist Zara Bergstrom of the University of Cambridge. 'Or if you argue with your partner, you want to move on.' In recent years researchers have amassed evidence for our ability to willfully forget. They have sketched out a neural circuit underlying this skill analogous to the one that inhibits impulsive actions. "The emerging data provide the first scientific support for Sigmund Freud's controversial theory of repression, by which unwanted memories are shoved into the subconscious. The new evidence suggests that the ability to repress is quite useful. Those who cannot do this well tend to let thoughts stick in their mind. They ruminate, which can pave a path to depression. Weak restraints on memory may similarly impede the emotional recovery of trauma victims. Lacking brakes on mental intrusions, individuals with attention-deficit hyperactivity disorder (ADHD) are also more likely to be among the forgetless (to coin a term). 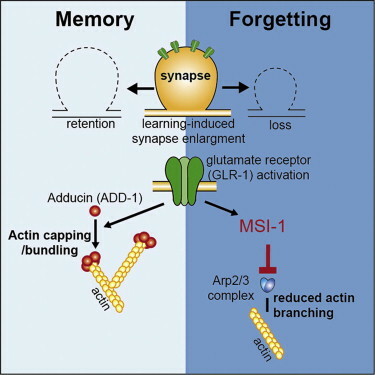 In short, memory -- and forgetting -- can shape your personality." Why would someone post, under their own email address no less, a long quotation without quotation marks, followed by a grammatically incorrect statement in quotation marks? The Old Mountain Goat know and understands - Do You?